Norwalk Branch NAACP President Brenda Penn-Williams attends the March 5 Norwalk Board of Education meeting. NORWALK, Conn. – Calls for Norwalk Board of Education Chairman Mike Barbis to resign continue, following emails criticizing prominent people of color, and some see the controversy as a cloud over educational issues. A meeting between Norwalk NAACP President Brenda Penn-Williams and Barbis, which Mayor Harry Rilling said he would arrange, is still pending, one month after Barbis’ comments about the NAACP became public. In the meantime, Penn-Williams is again circulating a flier alleging that Barbis “undeniably lied and demonstrated animus toward people of color and institutions that protect people of color.” The flyer encourages attendance at Tuesday’s BoE meeting. Rilling said Saturday he has been attempting to schedule the meeting between Penn-Williams and Barbis. “I’ve not heard back from them as of yesterday,” he wrote Saturday. “I am still willing,” Barbis wrote Saturday. The tension stems from an Oct. 5 e-mail, obtained by NancyOnNorwalk through a Freedom of Information Act request, in which Barbis urged fellow board members not to attend the NAACP Freedom Fund banquet that week because of what he said were “very serious false allegations and attacks” by NAACP leadership on the Board and administration. Penn-Williams and other NAACP leaders on Feb. 19 spoke to the Board to demand that Barbis resign; Barbis was absent. Barbis was present on March 5 when NAACP members continued their criticisms, and neither he nor BoE member Mike Lyons looked up or acknowledged the speakers in any way. Barbis snacked as he looked down at an electronic device. “It’s just a travesty where our Board is right now,” the Rev. Lindsay Curtis said last week, explaining that he was “really upset” by what he calls “arrogance and disrespect” shown by Barbis and Lyons. 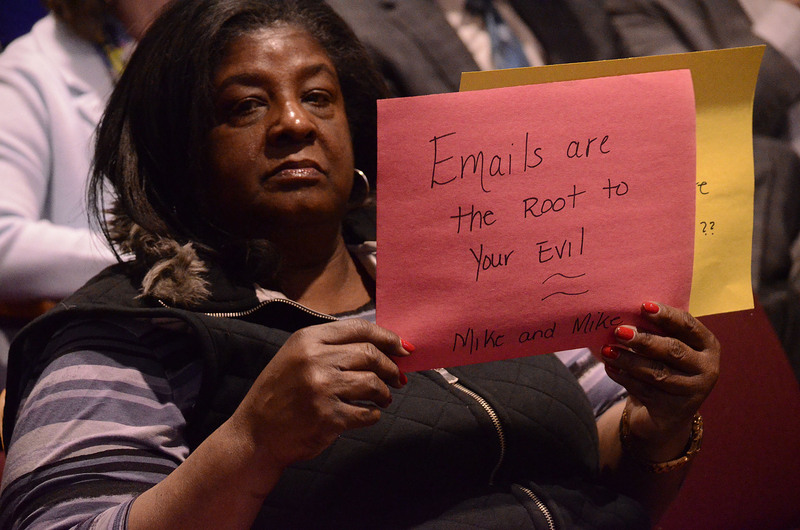 BoE Vice Chairwoman Sarah LeMieux on Feb. 19 apologized to Penn-Williams and other NAACP members in the audience, but some BoE members resent the attention the news media is paying to Barbis’ email and other emails that have since surfaced. Coverage is “helping to propel the idea that Norwalk is Ferguson,” BoE member Bryan Meek said in a digital message. Lyons, Barbis, and BoE member Bruce Kimmel complained that NoN’s Mar. 6 story did not include the Board’s Mar. 5 discussion of the district’s positive Accountability Results. NoN had previously published a story about the results on Feb. 12, mentioned them in the Mar. 6 story, and published a detailed story about the Board’s discussion of the results on Mar. 11; it is common for NoN to write multiple stories about the same meeting. Board member Julie Corbett said nothing about the NAACP presence on Feb. 19 but at the end of the meeting her comment on another topic could have also applied to the current controversy. Corbett said the apparent suicide of a Danbury high school student had been weighing heavily on her mind. “It’s so important that … every single student has at least one adult that they can….reach out to about any issue,” Corbett said. In a Feb. 12 NoN comment former BoE member Sherelle Harris called for unnamed board members to “grow up and get rid of the ego-grabbing, gang mentality.” A Mar. 9 op-ed by Harris thanked NancyOnNorwalk for writing a thorough story on the controversy and encouraged the parties involved to listen and understand one another. Harris also praised former BoE member Shirley Mosby, who has been the target of repeated criticism by Lyons and others for alleging racism by Board Members, claiming she had proof, and refusing to provide it in response to a FOIA request from NoN. The Board of Education is on a path to civil war, Jannie Williams wrote. Curtis last week said he was very grateful that Corbett asked for a breakdown of the Accountability results by demographics. I asked for Brenda Penn Williams to resign. Should I start protesting in town hall and holding up signs. Her behavior and hostility has been appalling the past few years and now she is rewarded by being named President of the NAACP. Now she uses her position as a bully pulpit. Thank you Nora for your apt comment and thank you Mike Barbis for ALL the Public Unbiased Service over the years. Why is this all about race? P/W keeps using the race card. Guessing it is a P/C thing to do. Gets you mileage with your followers, and people who want to perpetuate the race baiting. Slow down, step back. Make it about the children, their education, their futures. Applaud the B.O.E. for all their hard work and accomplishments. Yes come to meetings and speak civilly and bring ideas to the table for future consideration. Not make race based demands. It only perpetuates the divide. We’re getting a “civics lesson” here. Unable to secure its own members on the BOE the NAACP takes to the media. Without securing support of the City’s leadership. But giving the City’s residents ample opportunities to express their continued support and admiration for the fine work our elected BOE performs on behalf of our children. We know how the story ends. John’s Flynn’s alter ego Justin Case will address racism tonight. Just in case you are listening. Again, how can we BPW fired? That would be so much more important for Norwalk. Barbis is a good man who does and outstanding job. “…A meeting between Norwalk NAACP President Brenda Penn-Williams and Barbis, which Mayor Harry Rilling said he would arrange, is still pending, one month after Barbis’ comments about the NAACP became public. What an absolute debacle and sad commentary on the city of Norwalk. One month passes and no meeting. Regardless of the allegations and what transpired, it is simply inexcusable that Mayor 1 or Mayor 2 can’t get 3 adults on the phone, in a webex, on a conference call or in person to hash this out. Deaths, serious illness, pre planned meetings – ok perhaps here and there but NOT for 30 days. Did any of the 3 state what, when and how attempts were made? My manager would have been all over me demanding specifics on the attempts, timing and reasoning. If this issue is SO important and SO divisive, this should have happened and been done within 7 days MAX. The private sector world stops for critical meetings of this magnitude – it’s a 24-7 world and I’ve met at all hours of the day or night to efficiently “GSD” – Get _hit Done. But of course not: we are on Planet Public Sector here in Norwalk with another example of zero leadership from Mayor Rilling. Unreal.